Ephrata Cloister was a religious community that was established in 1732 in Ephrata, Pennsylvania. The Cloisters were a group of highly religious people who's duty was to support and engage in the everyday activities of their religious community. They believed in a strict interpretation of the bible, in self-discipline and helping one another. The Cloister members were very involved in industrial works such as: woodworking, carpentry, farming, papermaking, gardening, sewing, baking, etc. They were hard workers and believed in living off the land and helping out their neighbors, especially the poor. When it came to education, the children of the families were required to attend their German school. According to the history, at one time the community had 8 major structures that consisted of meeting houses and dormitories, in addition there were smaller structures that housed various workshops and mills. The entire property is designated as a Historic National Landmark and is open to the public for tours. If you're looking to plan a visit, they're open year-round but their hours do vary depending on the time of the year. You'll want to consult their website for their current days/times of operation. Admission to the historic site includes an introductory video, an exhibit in the Visitor Center, and nine historic buildings which can be explored by self-guided and cell phone tours. Admission ranges from $3.00 for children up to $10.00 per adult. Kids under 3 are free. Surviving buildings of the famous Ephrata community of Seventh Day Baptists, founded by Conrad Beissel, 1732. Turn to the right here to see this state historic shrine. When visiting, you'll want to wear comfortable walking shoes and dress appropriately for the current weather. You'll be doing outdoor walking, about the length of 2 city blocks. Some of the areas are wheelchair accessible. As someone who has issues with walking & balance, I found the walk to be easy and there are places where you can sit down if needed. After your done with your tour you can opt to visit their on-site gift shop which has some really cool gifts and souvenirs. There are picnic tables on the property, so if you want to plan ahead and bring a picnic lunch along with you, you can! The property is beautiful and I think you'll enjoy sitting outdoors, especially during the late spring and early summer seasons. We visited the Ephrata Cloister in the Fall when it was cooler outside and while the Fall Foliage was in full affect. I think you can see how beautiful their property is by viewing my photographs. This was our second visit to the property and if you can, I highly recommend that you visit in October, so that you can see the beautiful Fall Foliage too! 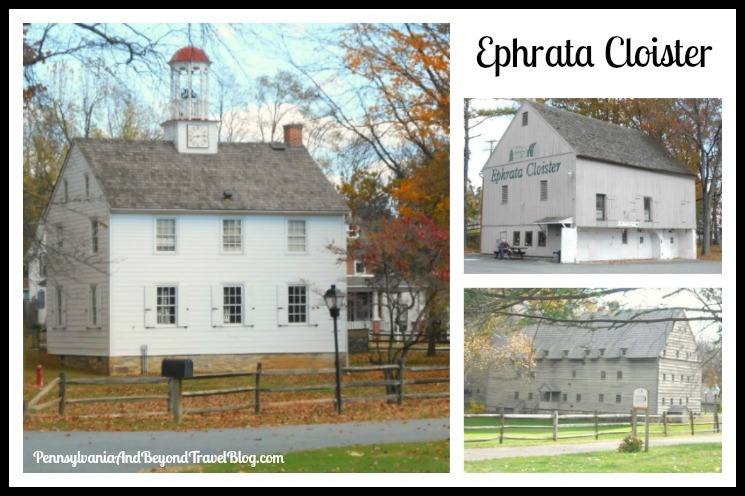 You'll find the Ephrata Cloister at 632 West Main Street in Ephrata, Pennsylvania. You're permitted to bring a camera onto the property if you're taking photographs for personal (not commercial) use. However, you can't use the flash setting, tripods or other accessories with it. You can visit their website to get more detailed directions and to read their entire visitor's policy. Looking for more fun things to see and do while visiting Ephrata? Check out our blog post on spending the day in Ephrata for some fun, family-friendly ideas! Note: You can double-click on each image in this travel feature. It will open up in a new browsing window and in an enlarged size. This will allow you to see the details up close. Thanks!